The present holder of the title of Karmapa is the 17th in succession. Born in 1985 as Apo Gaga, a child of a nomadic family in far eastern Tibet, he was recognized by all four cardinal vice-regents (gyaltsab) of the Kagyu Order in 1992 and later enthroned at the traditional seat of the Karmapa Lamas, the monastery of Tsurphu, in the sacred heart of the great Snow Land of Tibet. The 5th Karmapa (1384-1415) had several prophetic visions of the future. Many see in the activities of the 17th Karmapa a vivid fulfillment of the 5th Karmapa's vision. Details of the 17th Karmapa's life were foretold with startling insight by the very great saint, Chogyur Dechen Lingpa (1829-1870), in the mid 19th century. Chogyur Dechen Lingpa was one of the most renowned visionaries of Tibet and his accurate prophetic revelations concerning the succession of twenty-two Karmapa incarnations are amazing for their content. The songs of His Holiness the 16th Karmapa, Rangjung Rigpe Dorje, reveal further prophetic statements, foretelling the advent and life of the 17th holder of the Karmapa title. The 16th Karmapa predicted that the present 17th would play a major role in the restoration of Tsurphu and the return of Dharma to Tibet - this has now been proven true. In January of 1981 the 16th Gyalwa Karmapa gave to one of his heart sons, His Eminence Tai Situ Rinpoche, an amulet box with a brocade cover. Many years later, the box was discovered by chance to contain the prediction letter describing the future Karmapa's birth. After the passing of His Holiness the 16th Gyalwa Karmapa, it became the responsibility of his four vice-regents to carry out His Holiness's wishes, to continue the leadership of the Kagyu Order throughout the world, and to designate the future successor. The identity of the Gyalwa Karmapa is not decided by a popular vote nor a debate between parties. It is decided solely by virtue of the predictions and statements of the previous Karmapas. The 16th Karmapa's prediction letter states that the new Karmapa would be born "to the north in the east of the Land of Snow." This was determined at the March 1992 meeting of the council of the four vice-regents to mean that he would be found in eastern Tibet, north of Rumtek. In May, thanks to an exploratory party led by Choje Akong Tulku, the Karmapa was officially located in the Lhotak region of eastern Tibet, as predicted. This accurately fulfills the prophecy made by the 5th Karmapa, Deshin Shekpa, that "a heart emanation of Padmasambhava, coming from the West, one with a necklace of moles and dark face with protruding eyes, would... protect Tibet and especially Kham: at that time joy like the sun rising will occur for Tibet." We understand this to mean that Choje Akong Tulku, the heart emanation of Padmasambhava, was predicted from ancient time to find the sun-like child Karmapa, establishing lasting joy for the Tibetan people. The 17th Gyalwa Karmapa was born in the nomad community of Bakor, eastern Tibet, on the eighth day of the fifth Tibetan month, year of the Wood-Ox (26 June 1985). His father is Karma Dondub and his mother is a woman named Loga. He has six sisters and three brothers. The village in which he was born consisted of 72 nomad families, comprising about 430 people. After consideration of the evidence and a series of meetings with His Eminence Shamar Rinpoche, His Eminence Tai Situ Rinpoche and His Eminence Tsurphu Gyaltsab Rinpoche, His Holiness the Dalai Lama of Tibet granted his recognition of the 17th Karmapa and bestowed the official "Buktham Rinpoche" document stating that the child Apo Gaga, henceforth to be known as Urgyen Thinley Dorje, was the 17th successor. In contradiction to others who have put forth some controversial statements that there could, in these times, be more than one holder of the Karmapa title, His Holiness the Dalai Lama has stated that Urgyen Thinley Dorje alone may have this unique position, long ago established by virtue of sacred decree. The golden child was brought ceremoniously back to Tsurphu 15 June 1992, amid great rejoicing. Dancing and singing in the courtyard continued for hours, upon his arrival, with opera singers resplendent in their colorful costumes and masks, and with traditional temple dancers. On 27 September 1992 His Holiness the Karmapa was formally enthroned at his traditional seat, according to the custom of the ancient Ngasol ceremony. The rebuilding of Tsurphu Monastery occurred from 1992 to 1999. After the complete devastation of Tsurphu in the 1960s communist revolution, a few sections of the ancient monastery was rebuilt by impoverished but devoted Tibetan returnees. With the installment of His Holiness on the throne once more, the 17th Karmapa began a program of complete restoration. Much of the old monastery was reconstructed from the ground up, with new buildings, such as the Philosophy College (shedra), the Temple and rooms for the monks. 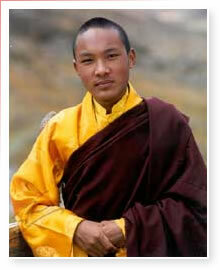 In late December of 1999, the youthful Karmapa took destiny into his own hands. During the years of his residence at Tsurphu Monastery, government restrictions imposed by the oppressive communist regime of Peking, limited His Holiness's ability to teach his disciples and receive teachings from his personal master, Tai Situ Rinpoche. His Holiness decided that it would benefit beings if he were no longer to stay in Tibet. With the coming turn of the millennium, His Holiness secretly left Tsurphu and after traveling for many miles in the worst weather conditions imaginable, succeeded in crossing over the border into freedom. After many perilous adventures along the way, he arrived safely at the seat of the Dalai Lama in Dharamsala, on January 5, 2000. Since then, His Holiness has been completing his extensive education, while a resident at Gyuto Tantric Monastery near Dharmasala. His Holiness the Gyalwa Karmapa is the supreme spiritual head of the Kagyu Order. The Dharma Fellowship, a small group of western followers of the Kagyu teachings initially established by the 16th Karmapa, met with His Holiness the 17th Karmapa, and was formerly reconfirmed as an official "chös-sde" of the Kagyu lineage on April 18, 2000, having sole allegiance to His Holiness. The Gyalwa Karmapa is our spiritual head, our guide and root Lama, and we look to him as the ancient custodian of the Four Transmissions of Tilopa and the oral lineage of Mahamudra, which are the priceless esoteric teachings that form the basis of our spiritual practice. The Dharma Fellowship is purely a practice centre, where we practice meditation, yogacara, and those special tantric exercises originally taught by the great saints and founders of the Kagyu brotherhood. We remain aloof from public teaching, scholastic studies and are entirely non-political. Even the internal administration or politics of the Kagyu Order has nothing to do with us at all. We simply follow the way of Buddhist Yoga, making homage to the Karmapa as our foremost guide, according to age old custom long pursued by yogis and yoginis in the Himalayas, in India, Burma, and in old Tibet.